It’s Time D-Heads! 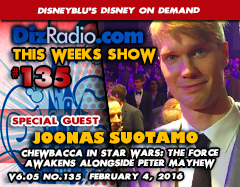 This week we go to a galaxy far far away as we welcome direct from Finland, JOONAS SUOTAMO (Chewbacca in Star Wars: The Force Awakens Alongside Peter Mayhew) to the show! 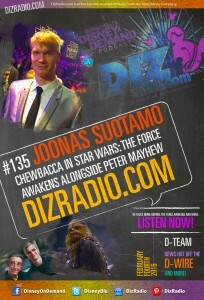 Joonas stops in and discusses how he landed the role of Chewie in the Force Awakens, working with the legendary Peter Mayhew, his basketball career, Star Wars Toys, being on set and more! In addition we have the D-Team back kicking it off with Erin answering your questions in I Want To Know and we have Jason giving you a Blu-Ray and DVD that we must add to your collection in The Vault. Paige is here with her musical talent in the Magical Music Review. 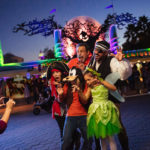 Nathan looks back at the books this week in This Week in Disney History and Cody stops in with the Hollywood Walk. And let’s not forget Caitlin giving us the latest from the Walt Disney World Resort in WDW-In-2. And for you digital fans we have Randy with the latest in Disney Multi-Media. 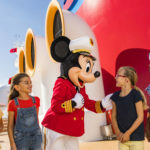 There is news hot off the D-Wire with news about Star Wars, Disney Channel, the newest Disney Park, Magic Kingdom, Kindermusik, The Lion Guard, Disney Junior, Disney Dreamers Academy, Disneyland, Season of the Force, The Finest Hours, Once Upon a Time, Disney Blu-Rays, Zootopia, and more!